Well Wednesday night I made the ultimate dinner! This has been a dinner that has been on my mind for a couple of weeks and I finally made it. The ultimate Cheesy Bacon Burger and a side of Sweet Potato Fries and of course my famous Spicy Chipotle Aiolo Sauce! Yum!! Yes that’s one fat burger!!! And I ate the whole thing!! First thing I did was throw the ground beef in a bowl, added garlic powder and black pepper and mixed with my hands. Then I split the burger into 8 2oz pieces. I used my scale to measure them out. Then I split my Swiss Laughing Cow Cheese Wedges in half and place half onto 4 pieces of the burger. Then I put the other pieces of burgers on top, and flattened with my hand. To make 4 4oz burgers. Place the burgers on the grill. Yah, I got to use the grill! It stayed light out till about 5:30. I love it! The days are getting longer! Meanwhile I made my Spicy Chipotle Aiolo Sauce. This is my favorite sauce. 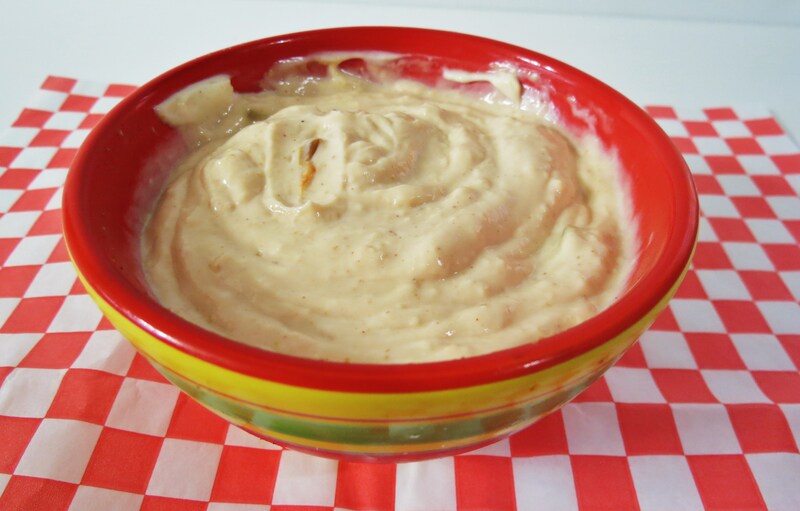 It’s great on burgers, sandwiches, used as salad dressing and dipping sweet potato fries in. 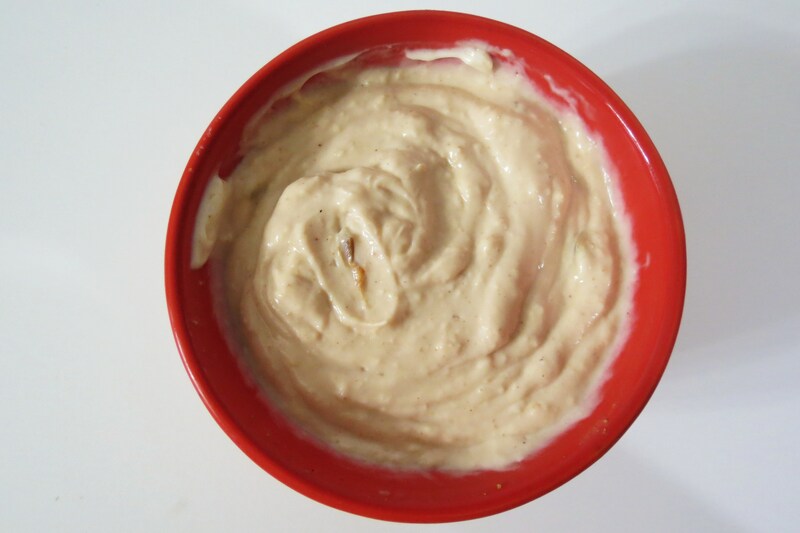 It’s made with fat free mayo, Greek yogurt, lime juice, chipotle chiles in adobo, garlic and Cumin. It’s so good!!! I like to keep a batch in the fridge for topping on my meals! Before I started anything, I started my Sweet Potato fries. All I did was cut 1 medium potato into strips, spray with cooking spray, added pepper, cinnamon and a pinch of Cayenne Pepper. Toss in a 400 degree oven for 30 minutes. My dinner was the best! Not the lowest calorie, but all healthy good things! For the bacon on the burger, I used Trader Joe’s uncured turkey bacon. I cooked it in a frying pan, like normal bacon. It’s the closest Turkey Bacon that I could find to normal bacon. If you like bacon, you need to try this one. It’s only 30 calories a slice, even my Husband who is a bacon freak said it tasted ok (ok is good from him) and little Jenny said she didn’t notice a difference. In a small bowl place all the ingredients together and wisk together until combined. Not bad huh! Where else can you find a sauce for 6 calories a tablespoon and tastes good? 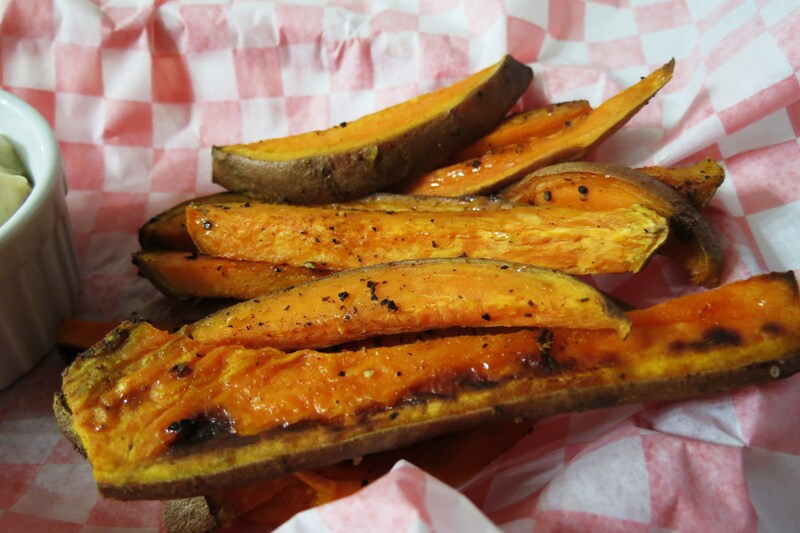 Cut the sweet potato into strips. Place on baking sheet. Spray with cooking spray and add your spices. Mix with your hands. Place in the oven for 15 minutes. Flip them over and bake for another 10 to 15 minutes until, slightly crisp. 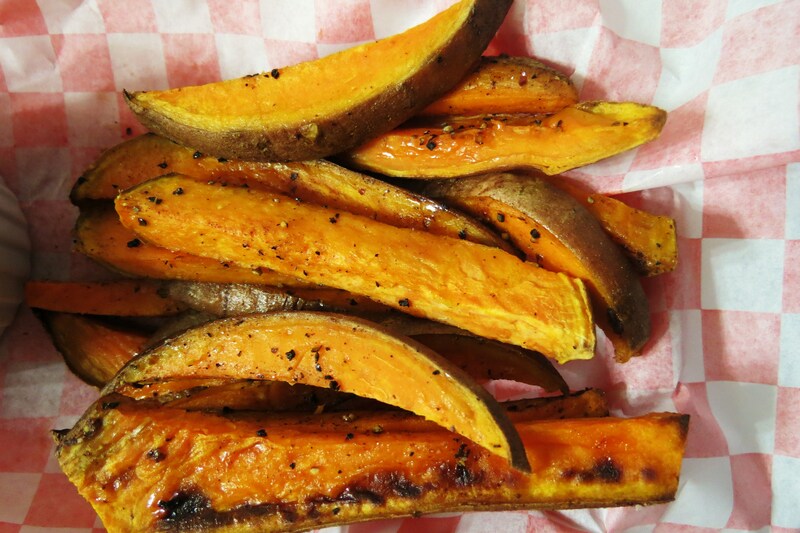 Calories for 1 serving (I used 8 oz sweet potato): 193, Fat: .01, Cholesterol: 0, Sodium: 122, Potassium: 754, Carbs: 45, Fiber: 6.7, Sugar: 9.5, Protein: 3.5 and a bonus 636% Vitamin A!!! In a pan cook turkey bacon according to directions on package. Once bacon is done being cooked, take the bacon out and set aside. Add bell pepper and onion into same pan, cook until tender about 10 minutes. Add ground beef to a small bowl, add garlic powder and pepper, mix well. 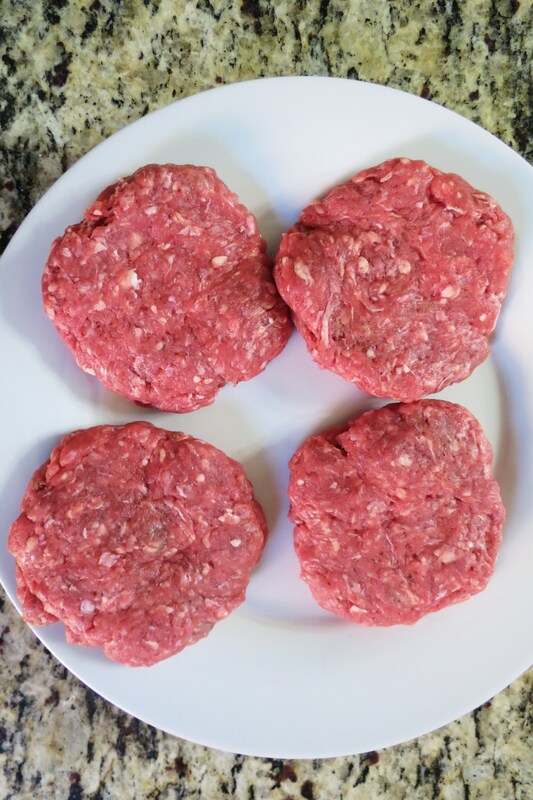 Divide the raw meat into 8 equal pieces (I used my scale to measure into 2oz each piece). 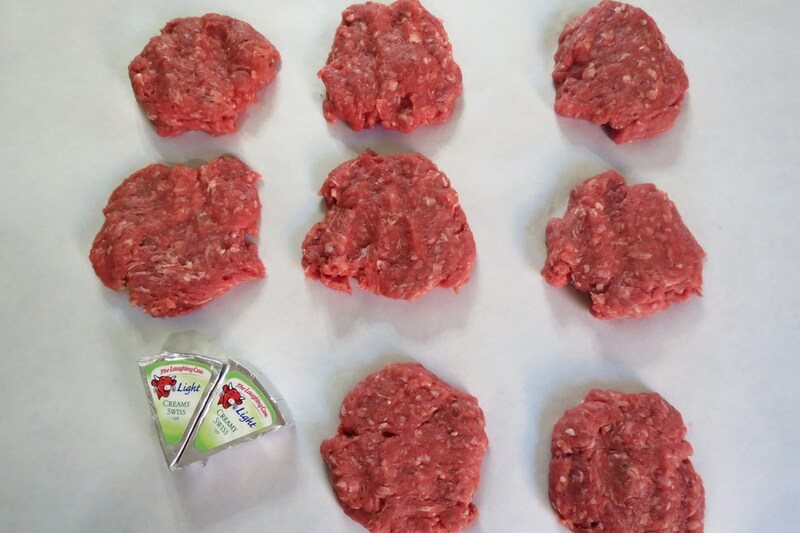 Flatten out the hamburger, and place 1/2 a cheese wedge onto each piece of hamburger. 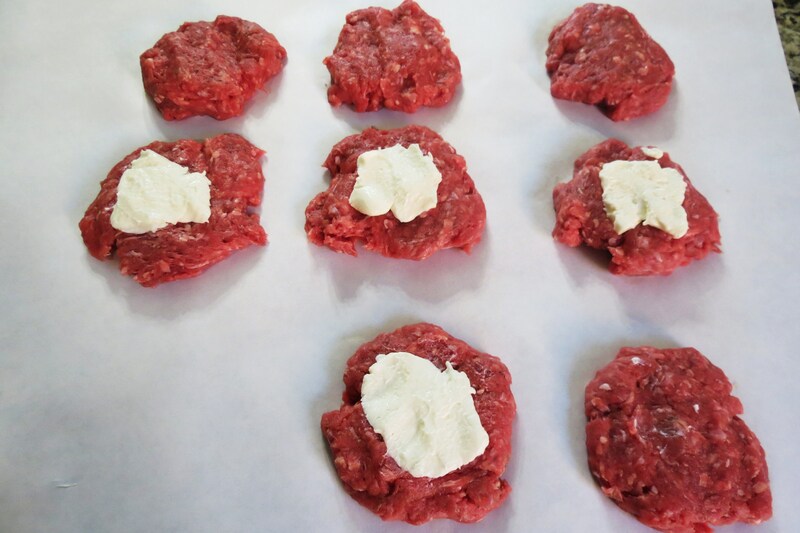 Take the other pieces of the hamburger and place on top of the cheese , and squish them togther and seal the edges so the cheese doesn’t ozzz out. Place on grill and cook until done. About 5 minutes per side. 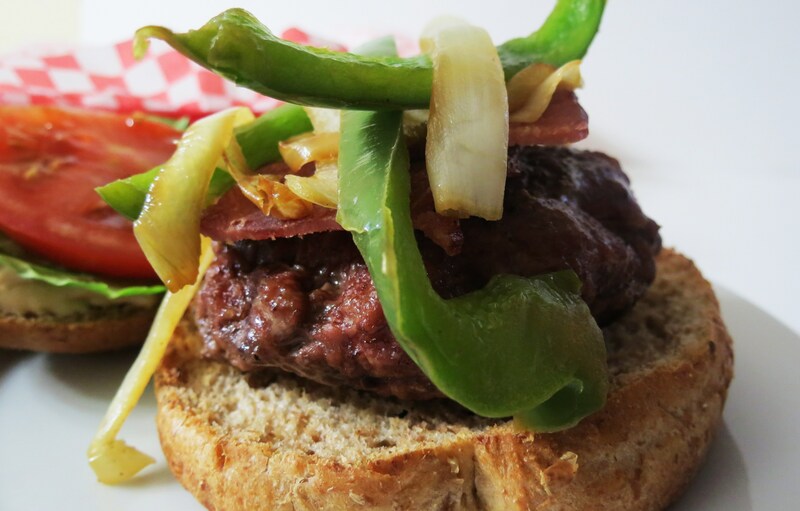 Place burger on buns, top the burgers with bacon, peppers & onions and sauce. I would of taken a picture of the burger on the inside, but when I cut it, I smooshed it apart and it wasn’t pretty. Don’t worry when you take a bite you’ll get an oooz of cheese. So good!!! 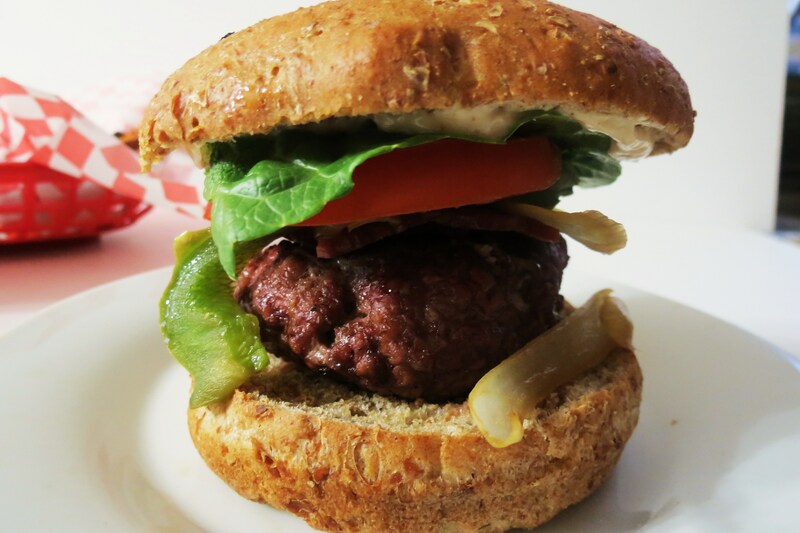 If you want to get an idea, check out my Cheesy Stuffed Burger. I hope you enjoyed my burger night! I just needed a burger! Do you ever get like that? Normally I’ll eat my burger between Romaine Lettuce, but tonight I needed the bun and all. 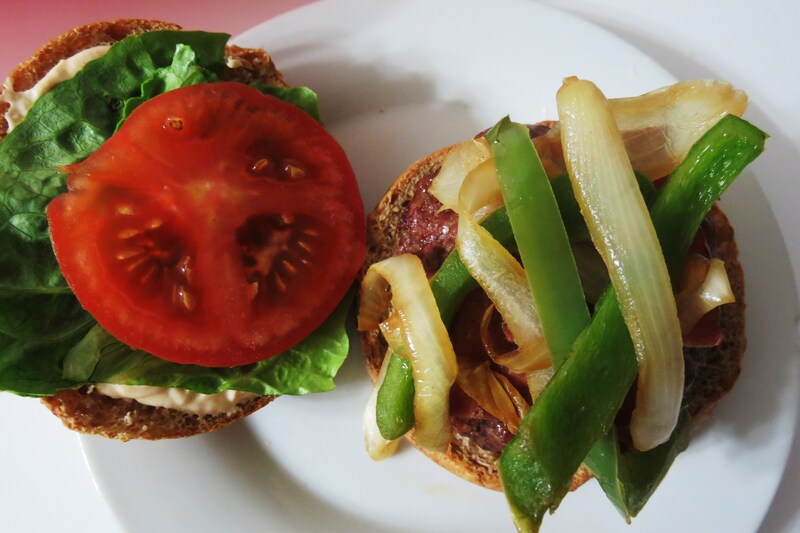 I used Alvarado Street 100% Whole Wheat Sprouted Bun. So good. I also toasted my bun on the grill to make it a little crispy. Yum!! I’m so full!!! Oh you’ll probably have left over onions and peppers, just place in them in the fridge and add them to eggs, sandwich or make a quesadilla with them. That will be tomorrows lunch! My husband would absolutely love this recipe! As a treat, I’m going to make this over the weekend! He’s a total burger and fries type of guy! Hi Jenn, If you make the burgers, let me know how it goes over! 🙂 Have a great day! What kind of buns do you use? They look fabulous! all of that looks soooo good to me right now!! Just connected to your site via Foodbuzz. My wife and I absolutely love stuffed burgers and sweet potato fries. Great recipe for the Aiolo sauce. You have so many good looking recipes on this post. 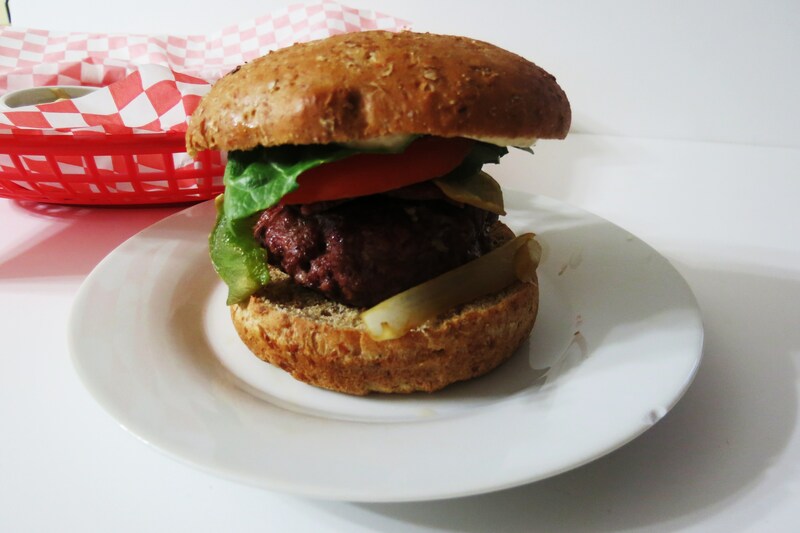 I normally don’t make burgers from scratch, but his recipe looks good. I buy the Laughing Cow cheese bulk at Costco so I always have on hand. Great idea on putting it in the burgers, makes it taste moist and add cheesy goodness. I just told my friend that you said they have Laughing Cow Cheese at Costcos and first thing she did is Google it. Laughing Cow is the new thing in our office, love the stuff!! The cheese is so good in burgers, especially the chipotle cheese wedge. You have to try it! 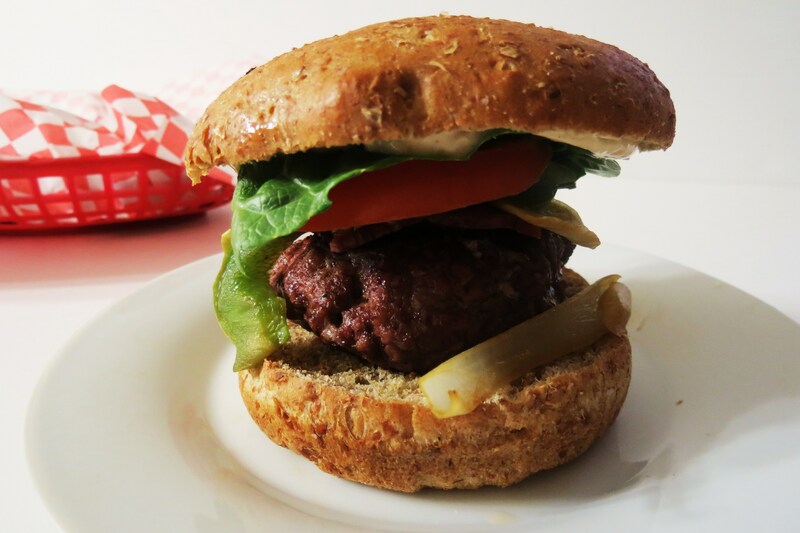 I’ve done it with Turkey Burgers too, so good! I just ate lunch, but now I am hungry all over again. This looks sooo good! I want to eat everything-the burger, sweet potatoes and the amazing chipotle sauce! WOWZERS! That meal looks more delicious than you can imagine! I just brought my hubby home from the hospital and we’re on a soft food ‘diet’ for a while…think I’m gonna have to make myself a burger and sweet tater fries without him knowing. =) Thanks for your nice comments at my blog. I appreciate every one of them. You’re right that is the ultimate meal! 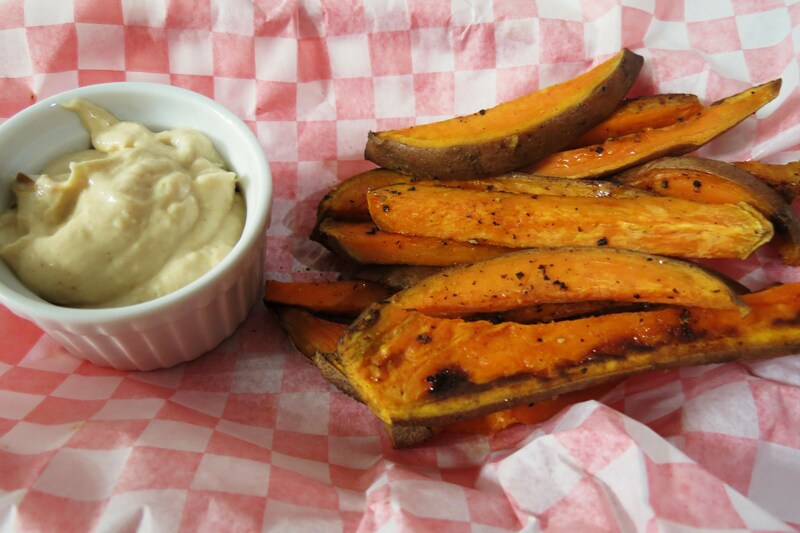 Aside from movie popcorn, burger & fries are my favorite…and I LOVE sweet potato fries! 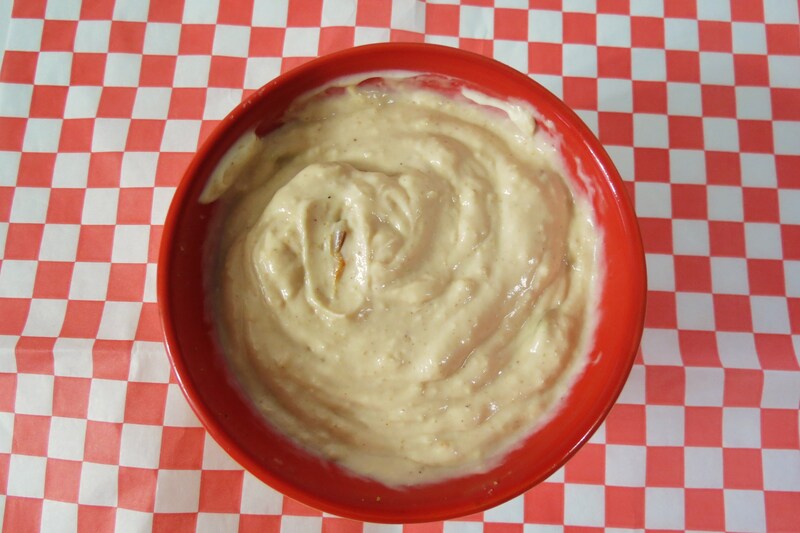 That dip looks perfect and I happen to have SO MUCH greek yogurt on hand right now…going to make it I think…tweaked, maybe skip the mayo & garlic, and play around with things with what I have on hand. Your recipes are so amazing and you take the best pictures! I could never food blog like this, lol. Thank you! I find the hardest part about food blogging is taking the pictures. I have so many recipes that I couldn’t post because they didn’t look very appetizing! I appreciate your kind words, it made my day!! Thank you again!! Wow, now this is a legit burger! And those fries? What an awesome combo.